Positive Response Assistance Dogs (PRAD) trainers are accredited public access testers under the Guide Hearing and Assistance Dog Act 2009 (GHAD). We have been training and accrediting owners and their dogs with disabilities since 2015. There are NO joining fees and you do not have to belong to any other organisation. 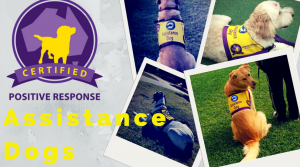 If you are with another organisation currently that are not accredited under GHAD 2009, you may stay with them if they are offering you other types of support however your training will come under the auspice of Positive Response Assistance Dogs. (PRAD) This means we are your trainers and your dog must, once certified, wear our jacket and continue training with us. We also work with people who have mobility issues along with any of the above. For a full overview of our processes and training requirements please read our Guidelines for Assistance Dog Eligibility. Please also read through our comprehensive FAQ page for further information. If you are looking to commence training with a baby puppy please take a look at the Puppy Financial Table which has a rough breakdown of the costings involved in raising and training.